If you are going to try a new potato salad, it has to be this one. 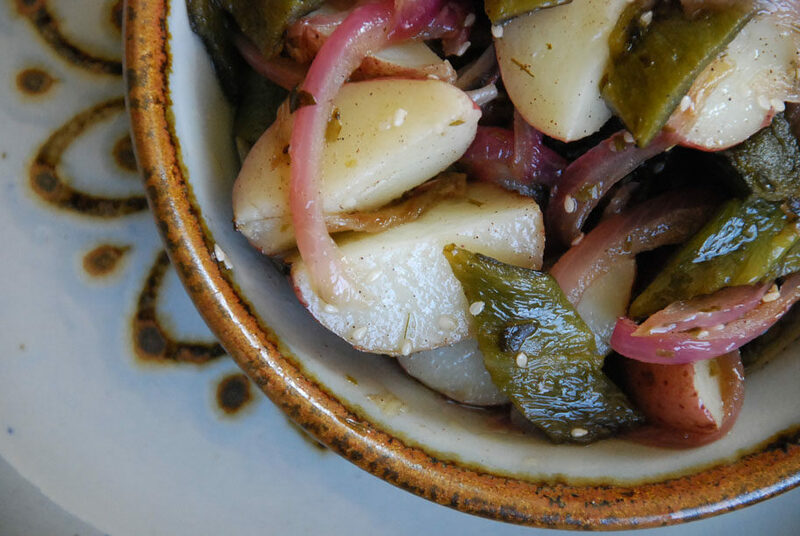 Soft tender potatoes are combined with an exuberant poblano chile rajas, or strips, and lightly caramelized red onion mix. It’s not a creamy salad, but one that has an unexpected vinegary kick, laced with olive and sesame oils. In my kitchen, it’s a well documented fact that poblano chiles love the company of allspice. And it is no secret that potatoes love to be showered with tarragon. Mix it all up, and I want to eat the entire serves-six-people bowl. Of course, potato salad is as familiar and old-fashioned as apple pie, but you have never tried one like this. 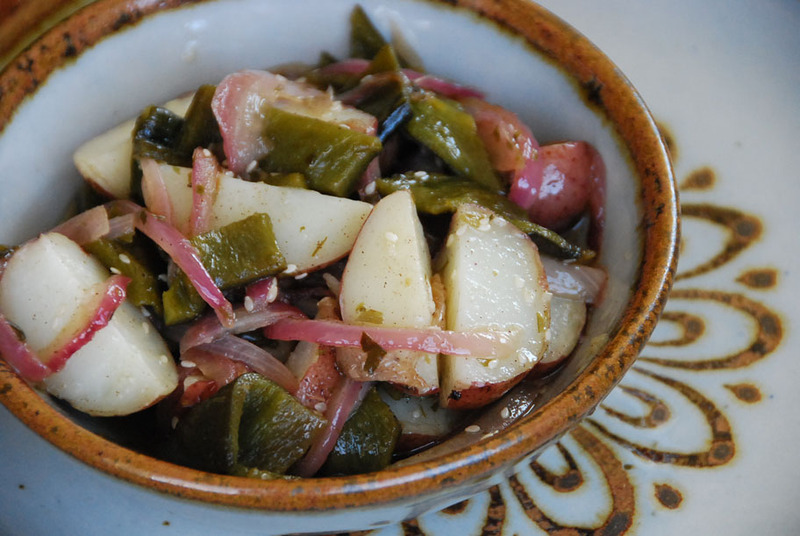 It brings the character of Central Mexico, where the combination of papas con (poblano) rajas has a long history at the table. But this may be the first time you see that combination in a salad form. Perfect, I thought, if it comes out as I am hoping, to bring this substantial salad to your table for Easter, or Passover, or a cookout, or any occasion you may have in mind this spring, where a big bowl of the best-ever potato salad will come in handy. And: I loved it! Don’t think about this as a potato salad with chile peppers. We are not using a spicy chile for the heat. We are adding the grand poblano chile, which is more like a stunning vegetable with mild heat than what many people consider all chiles to be. 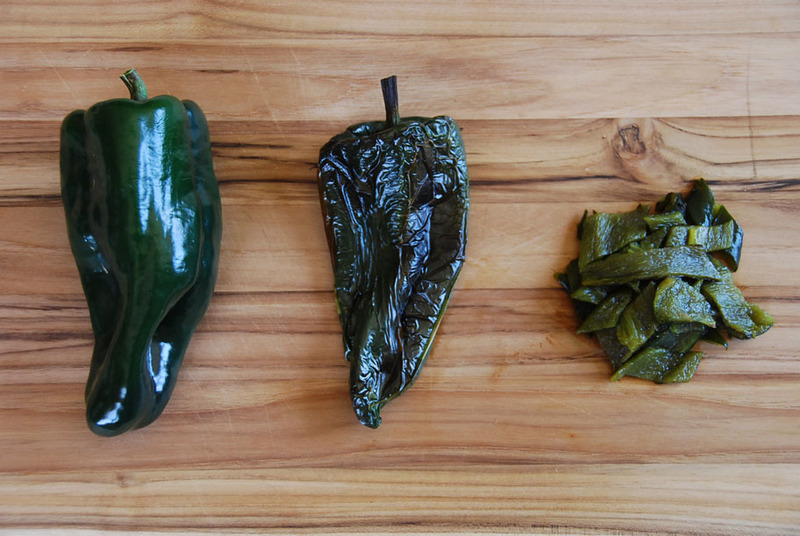 Not only is the poblano a large, shiny, curvy, dark green beauty – it also has the most extraordinary rich, fruity, spirited flavor. 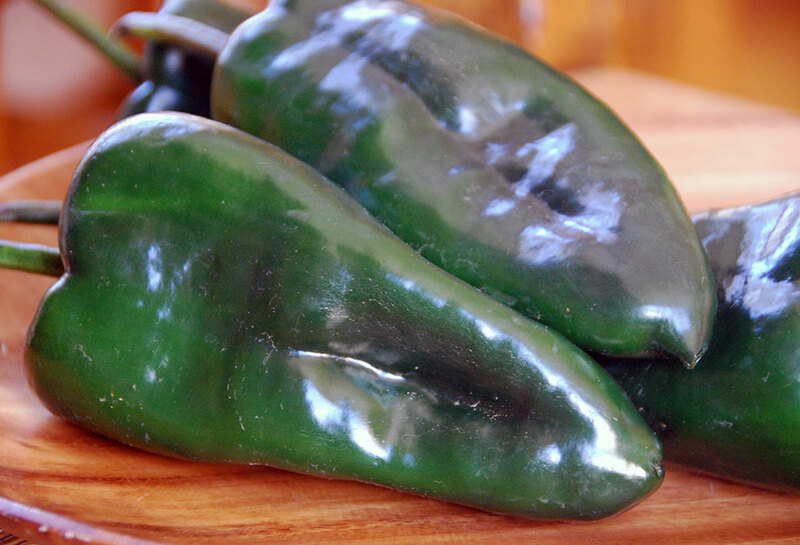 However, the poblano chile is a bit timid in it’s raw form and calls for a little coaxing, or prep work, before it can bring out its finest flavor, color and texture. Though, not to worry, it’s very easy to master the process of charring, sweating, and peeling the chiles. Once you prep the poblanos a couple of times, you’ll see it’s no harder than roasting a red bell pepper. And the reward is in the deepened flowery, smoky, mildly spicy flavor of your transformed poblanos. This salad is versatile, too. I like it warm, but you can eat it any way you prefer or best suits the occasion: warm, room temperature, or cold. And it’s filling enough to eat as a main course for a quick lunch or as a side dish for a celebration table, for sandwich night, or for a backyard BBQ. Bring a large pot of salted water to a rolling boil over medium-high heat. Drop in the red potatoes and cook for about 20 minutes, until they are cooked through and the tip of a knife goes in without much resistance, but the potatoes are not falling apart. When ready, drain into a colander. Once the potatoes are cool enough to handle, cut into halves. In a large deep skillet or casserole, heat the olive oil over medium heat. Once it is hot, add the sesame oil. Stir in the red onion and cook for about 12 minutes, stirring once in a while, until they have completely softened and edges have begun to slightly brown. Incorporate the poblano chile rajas (strips), stir, cook for a minute or two. Pati I made this tonight for me and my boys. Saw this show and went on line and grabbed the recipe. Yummy! I enjoy your show! I’m so glad you and your boys loved the salad! Aww thank you so much, Jackie! Should the sesame oil be toasted? Can’t wait to make this! I use regular sesame oil…and I hope you enjoy the salad! My family loves this above all the other recipes, which they are very fond of! That is super amazing! Thank you for sharing Marion. This recipe looks wonderful. I’m going to make it this weekend for a Labor Day BBQ, but I have a question about the sesame oil. I’m assuming you should use roasted (dark) sesame oil, as the unroasted kind does not have much flavor, but it’s always been my understanding that roasted sesame oil should never be used to sauté, and that it only should be added to dishes as a condiment. Does the cooking mellow the flavor? (2 tablespoons seems like quite a lot.) Thanks! Hi! I do use it for cooking, roasted, however, I heat it up for a very little time. It does not mellow the flavor at all, and I like its strong presence, try it out! Thank you! Made this yesterday for a BBQ, and everyone loved it. Do you have a time estimate for boiling the potatoes? I ALWAYS overcook them. I made this recipe today and it was delicious but my potatoes weren’t as pretty as yours. I just made this for lunch today for my family and esta muy delicioso! Allspice is new to me but you were so enthusiastic about it on your show I felt confident I would like it too and I absolutely did. Thank you for the great recipes! I love watching you cook, you make it look so easy. I am not the best cook but will try to make some of your yummy recipes. I really like Mexican food. I have made this recipe many times, and often take it to pot lucks,where it is always a big hit! I have your cookbook and have made and enjoyed lots of your tasty recipes! I learned about you on Create TV. Thanks for all you wonderful recipes and information! Hi Marilyn, Thank you so much for getting my cookbook and for watching! Happy to hear you are enjoying the recipes!! Is the oil you used *toasted* sesame oil? Suena muy rico con jamón! I love your show every Sunday I watch and love your recetas Gracias. What would be good in place of the white wine vinegar? Any other crisp vinegar that you like… such as white distilled vinegar. Espero que te guste muuuuucho, Jose. OH MY GOODNESS!!! Must make this dish this weekend. Thank you so much Pati for opening my eyes to trying chiles but especially the poblano! I have to admit I am a bit of a spice wimp but trying to develop a stronger tolerance and I just LOVE the poblano. NEVER would have tried cooking with it without your show and guidance. Thank you! Delighted to hear! It is one of my favorite ingredients, by far. utterly fantastic! I had leftover boiled organic gold potatoes, so I used them. fyi, I char the pepper under the broiler on foil; then wrap the pepper in the same foil to sweat. GRINGO ALERT! wow, good thing I only used one pepper–SPICY! as pati says, the heat can vary….. was out of rice vin., so I used cider. same with sesame, used veg. oil. using tarragon, allspice, and frying the onions–GENIUS. and the colors, so pretty and pastel for spring. Looks wonderful and I live rajas. Pati, would you ever put a bit of meat in this? I was thinking of a potato salad my mom makes with little pieces of bacon. Might be tasty. Oops, I meant love not live! Hola Pati, it looks delicious I will have to make it soon! I love your show thank you for your encouragement. What a wonderful discovery we made today, quite by accident. Living in Scottsdale, AZ, we have come to LOVE Mexican cooking. Exactly what was that item assembled in a tall tapered glass with layers and layers of what looked like corn, peppers, cream, and more. It was wrapped in a napkin and eaten with a long spoon. I WANT IT! And everything else, tambien. Luce deliciosa. Voy a prepararla. Que tenga un buen fin de semana. I love cooking with poblanos. I char several on the wood grill outside, sweat them, peel them and then freeze them individually so I have them when I need them; the smoked flavor in them is really wonderful. Elaine, I love them, too! Freezing them is a great idea – I do this as well. Thank you Pati for the lovely recipe. Have a Wonderful Weekend! I hope you do too, Liz! This looks amazing! I’m ready for summer. Will try soon. Thanks for sharing this creative take on the basic potato salad.